Mauricio Pochettino admits he liked hearing the fans frustration when he substituted Lucas Moura, but says the win reinforces his decision. 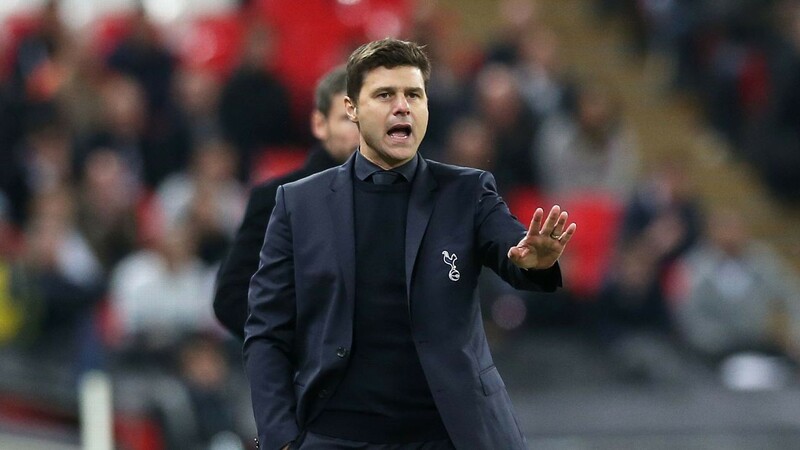 Mauricio Pochettino said Tottenham and their supporters should be grateful for being able to use Wembley, although he admits it will be a major boost when the club move to their new home. The Wembley pitch has been in a poor condition for Spurs' last two home matches, having been battered by three NFL games last month. PSV Eindhoven manager Mark van Bommel described the surface as "s---" after watching his side beaten in the Champions League on Tuesday, while an attendance of 46,588 meant the stadium was half-empty, but Pochettino argued that Spurs were probably affected more. "Listening to the manager of PSV after the game, he was complaining about the pitch. But we dominated and had 75 percent of the possession. I think if someone was affected by the pitch, we were. "We're not going to complain because we are so grateful and so lucky to have Wembley. Without Wembley now, we play where? We cannot blame Wembley, and I think we need to be grateful because we can compete in London, close to White Hart Lane, close to our training ground, and that is a massive advantage for us. "Of course, after that you feel disappointed because it's not your home, it's not your house. But I think the legacy of Daniel [Levy] and the board and what the club is doing for the rest of our lives and the next generation of Tottenham fans, it's massive. That's why we need to have patience. "The other day we were talking in the meeting with the players and all the staff, and we start to feel it's so close and it will be a big boost for us to compete there. "For our fans, they need to start to create in their minds and think that one day more in Wembley is one day less to being in our new stadium, and that starts to create your motivation and inspires you to feel happy, optimistic and to translate a very good energy. "If we're capable of arriving and starting to play in our new stadium in a very good position, being involved in all competitions, I think our fans in our new stadium are going to be key and decisive maybe to try to win something." Tottenham will be without Mousa Dembele at Crystal Palace on Saturday, after the midfielder was ruled out until 2019 with ankle ligament damage suffered at Wolves last weekend. "We hope that from the beginning of January he will be ready," Pochettino said. "Always you miss all the players when they're injured. In 13 days we're playing five games. Every two and a half days we're competing. It's a massive effort for the players. "I think we have some players back like Eric Dier and Victor Wanyama -- they've started training with the group and we'll see tomorrow if they can be available to be in the squad for Saturday. It's good news. Like Dele Alli and Christian Eriksen [they're] building their fitness." Spurs will also be without Jan Vertonghen and Danny Rose at Palace, the latter missing a seventh successive match after suffering what was initially thought to be a minor groin injury against Cardiff in early October. "It's a little bit longer than we expected," Pochettino said. "We hope it will be after the international break. It might be difficult for the week after the international break but we'll see. "I saw him this morning. I asked for his perfume because he has very good perfume. We share taste."